(Warning: This is so not a wordless post. Ssshhhh) Anyone else a Cake Boss fan? I started watching it after I came home from the Wilton ReTreat, all inspired. And after begging my husband Joe to watch it with me, he instantly became hooked as well. We finished the whole first season within a week. For the first time my husband requested I make him a cake for his birthday. And not just any birthday cake. He wanted an elaborate yellow fondant cake, preferably with something molded with Rice Krispie Treats (yeah right!) 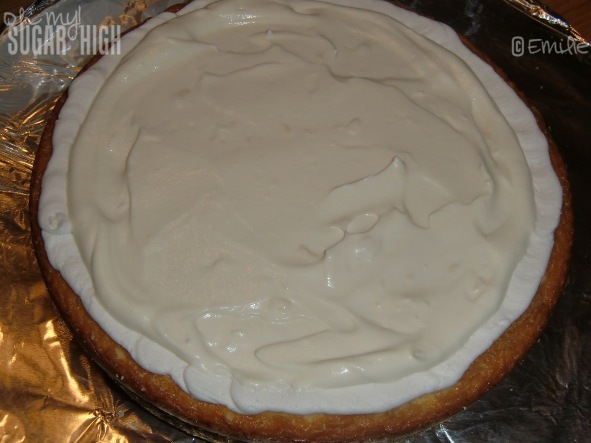 and a vanilla custard filling. That is a tall order for a cake decorating newbie like myself. Sure, I had a blast at Wilton and love watching Cake Boss but that certainly didn’t make me an expert. As you may notice that isn’t a custard filling. 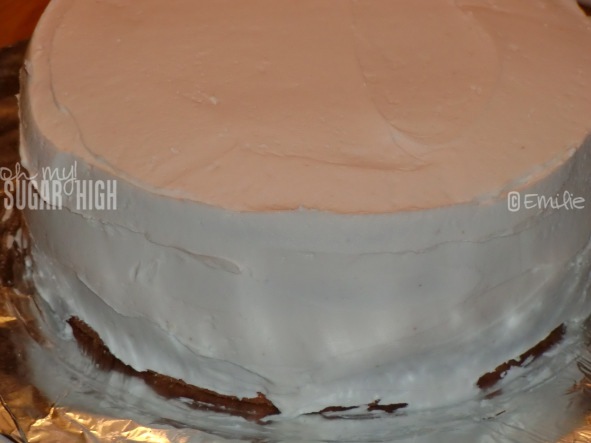 (See last week’s Wordless Wednesday for my custard disaster turned delicious dessert). Instead it is some cool whip and pudding. I got tired. 🙁 And do notice the icing dam. If you are building a cake with a filling I strongly recommend pipping a dam around it to avoid it slipping or oozing out. I “dirty iced” it (added some buttercream icing). And rolled out the homemade marshmallow fondant, thanks to Cat’s awesome tutorial. Using my fondant circle cutters and a pastry wheel I created this rather unoriginal design but at this point I was just going for something that looked nice. It is so much more difficult to design a cake for a man. A woman I could have done a floral arrangement and it would have looked stunning. But for a guy? Not so much. I tried to create a message in chocolate writing but that was a bad idea in July. Within seconds after coming out of the freezer they began to melt so I decided I’d have to keep it simple with just my husband’s age. Not a perfect cake by any stretch but it was MY cake and a total labor of love. Em I think you did such a great job and you want to know something else, thanks to you I’m HOOKED on Cake Boss. And you know what else … Jon is too! I was so surprised but it’s the only foodie show he’ll watch with me and actually even likes it because of Buddy. I think Buddy and all the other “macho” guys baking and decorating cakes makes it more appealing to men. Plus, it really is just amazing to watch them in action. 🙂 Glad to hear Jon likes it too. I think it turned out really well, Emilie! 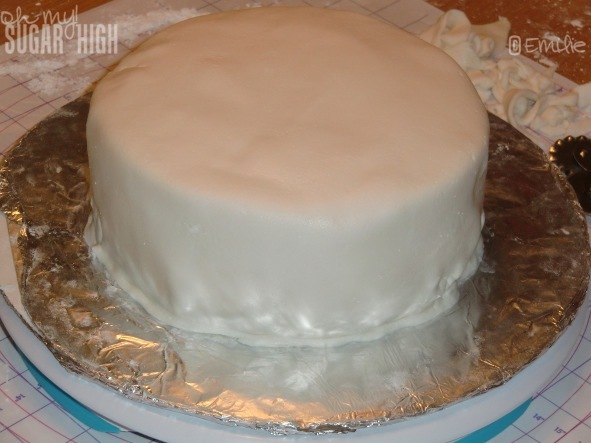 Seriously, you’d never know you’re a fondant newbie! LOVE Cake Boss!! And your fondant cake is gorgeous! That cake looks great! I have always wanted to try making a cake with fondant but to be honest it’s scared me to use it. Is it hard to use? No, it really isn’t bad at all. It is much like working with pie crust. It is super forgiving actually. The most important thing is that you buy the tools to create something that you can be proud of so you don’t get frustrated and quit You definitely would want a fondant roller with the rings for measuring so you can get it nice and even. (Trust me, I tried a regular rolling pin and it is not even close to the same and is super hard to work with. ) A fondant mat for easy rolling and measurements is great too! Buy a few cutters and you can create something gorgeous. One good tip for fixing mistakes though is to just use a tiny bit of shortening if you rip it and to get the other pieces to stick to each other use a bit of water. If you do decide to try you have to come back and share it with us! It is a FANTASTIC cake!! Really good job. I’ve watched those cake shows and thought of trying out fondant but it seems really tough to do. This looks amazing. I am going to try to learn a little cake decorating this week via some online tutorials. Wish I had you or Cat nearby to teach me. 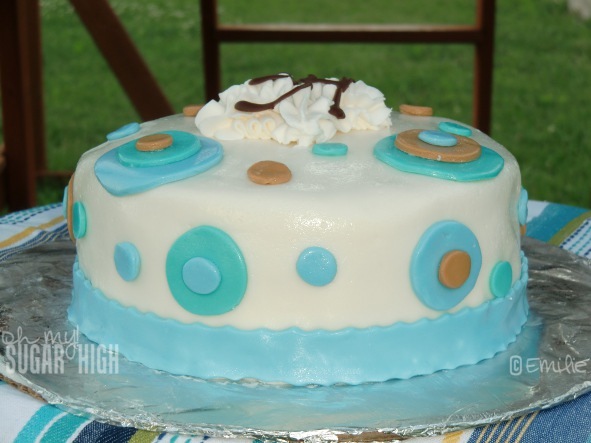 My daughter wants a Topsy Turvy birthday cake for her birthday next month and I’ve never done anything like this – I’m more of the go pick up a cake at Kroger type mom…I’ll have to take pictures and blog it! I’m sure it won’t turn out as lovely as yours. 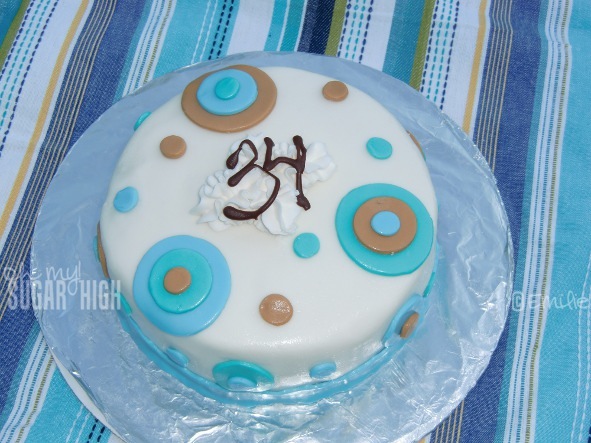 I think it looks fantastic, esp fpr your first fondant cake! It’s very difficult to smooth it out so nicely. That is great! Fondant is on my list of things to master. Good for you. The cake looks great for your 1st effort. Mine didn’t turn out as well when I first tried out fondant. Wow! I give you an A for effort and an A+ for the project, good job. Thanks for sharing! ?Mrs. Hart? I think it looks great, A LOT better then anything I could do! It turned out great! I love the layered dots! Someday I’d like to try and make fondant, it looks like it would be fun to work with! Yummy! And beautiful too. I think I am hungry now. I would love for you to come read my WW post at http://traci66.blogspot.com/2010/07/wordful-wednesday.html Have a Wonderful Wednesday and continue making the beautiful cakes. I watch both Ace of Cakes & Cake Boss on occasion. The pastry competiona are fun to watch too. Nice job on your 1st fondant creation. I haven’t done a fondant cake in over a year. My family peels it off, so it seems a waste, for us. Great Job on the cake there! I love it! Not bad at all! I love it. that came out great. it only looks a little shiny, was it really hot that day? Really nice job Emillie! I think anyone would love to have that cake for their birthday. I am getting inspired to try a fondant cake myself soon! It looks beautiful 🙂 I need to make one soon, last time I made fondant cake was last September for my sisters 18th birthday! It turned out great!! Good job! great job! i make lots of fondant cakes too 🙂 ive been wanting to try that marshmallow recipe, how was it? tedious? or pretty simple? You did a great job! The cake is beautiful!